AKAs Billy Batson and the Legend of Shazam! / Shazam! Synopsis This synopsis is too short and may not include the required detailed description of the entire plot. We normally require that synopses be at least 10 lines long. If you have seen this title, please help us by improving and expanding this synopsis. 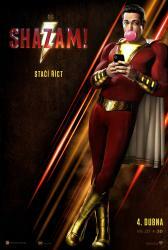 Billy Batson, a youth who works as a radio news reporter is chosen to be a champion of good by the wizard Shazam. Whenever Billy speaks the wizard's name, he is instantly struck by a magic lightning bolt that transforms him into an adult superhero empowered with the abilities of six mythical figures. S the wisdom of Solomon. H the strength of Hercules. A the stamina of Atlas. Z the power of Zeus. A the courage of Achilles. Finally M the speed Mercury. With a single word Billy Batson becomes Captain Marvel.